Thursday 31st August 2017 – 12.55pm – Murray MacGregor. A lorry driver has died after his vehicle overturned. It happened at about 10.00am on the A50 near to JCB Services World Parts Centre at Beamhurst in Staffordshire. A rapid response vehicle, an ambulance, a community first responder, a paramedic officer and the Midlands Air Ambulance from Staffordshire were sent to the scene. An off-duty doctor also stopped to assist. A West Midlands Ambulance Service spokesman, said: “Another lorry driver stropped and tried to assist the other driver. He was joined by police officers. “Ambulance staff arrived shortly afterwards, but sadly it quickly became clear that nothing could be done to save the driver in the overturned lorry and he was confirmed dead at the scene. Tuesday 29th August 2017 – 8.55am – Murray MacGregor. A man has died after a crash between a 4×4 and a tractor pulling a trailer with hay on it. It happened last night in Herefordshire on the A49 between Bryn Garth and Much Birch near to the Axe & Cleaver. Two ambulances and a paramedic officer were sent after the alert was raised at around 9.45pm. A West Midlands Ambulance Service spokesman: “On arrival, ambulance staff found the 4×4 on fire with a hay bale also on fire. “The man driving the 4×4 was confirmed dead at the scene. “A 34-year-old woman, who was the front seat passenger in the 4×4, had been able to get out of the vehicle and was treated for facial injuries at the scene before being taken to Hereford County Hospital. Tuesday 29th August 2017 – 8.50am – Jamie Arrowsmith. A pedestrian has died following a collision with a car in the early hours of this morning. West Midlands Ambulance Service was called to City Road in Edgbaston shortly after 1.50am and sent two ambulances, a rapid response paramedic, a paramedic officer and a MERIT trauma doctor to the scene. A West Midlands Ambulance Service spokesman said: “On arrival at the scene, police had commenced CPR on the patient, a man, after he was found to be in cardiac arrest having suffered serious injuries in the collision. “Ambulance staff took over CPR and administered advanced life support. “The man was then moved on to the ambulance with treatment continuing en-route to Queen Elizabeth Hospital, Birmingham. Friday 25th August 2017 – 4.50pm – Jamie Arrowsmith. Thursday 24th August 2017 – 5.15pm – Jamie Arrowsmith. A car driver has received specialist trauma care and been anaesthetised by ambulance staff following a collision with a lorry this afternoon. West Midlands Ambulance Service was called to the junction of Limbrick Close and Haslucks Green Road shortly before 3.30pm and sent an ambulance, a paramedic officer, a BASICS doctor and the Midlands Air Ambulance from Strensham to the scene. A West Midlands Ambulance Service spokesman said: “On arrival crews discovered an elderly male still inside the car following the collision. “He was rapidly helped out of the vehicle before receiving treatment for serious injuries. “In order to stabilise his condition, the man was anaesthetised before being taken to Queen Elizabeth Hospital, Birmingham on blue lights and sirens. Thursday 24th August 2017 – 4.45pm – Jamie Arrowsmith. A total of 13 patients have been treated by ambulance staff, three of whom required hospital treatment, after they were found on the back of insulated lorry this afternoon. West Midlands Ambulance Service was called to Mangrove Service Station in Rugby just before 2.30pm and sent three ambulances, two paramedic officers and the Warwickshire and Northamptonshire Air Ambulance to the scene. A West Midlands Ambulance Service spokesman said: “Crews arrived to discover 13 patients who had been travelling on the back of a lorry. “All of the patients were male, with three of them receiving treatment at the scene for signs of heat exhaustion before they were transferred to University Hospital Coventry and Warwickshire on land ambulances. “None of the injuries are thought to be serious. Wednesday 23rd August 2017 – 8.42am – Murray MacGregor. A teenage motorcyclist has been badly hurt after a collision with a tree. The incident happened on Lawley Drive, heading towards the M54 in Telford at about 9.45pm last night (Tuesday). A West Midlands Ambulance Service spokesman said: “On arrival ambulance staff found members of the public providing care to the 18-year-old man, who had suffered multiple injuries. Tuesday 22nd August 2017 – 9.40am – Claire Brown. A cyclist has suffered a potentially life-threatening head injury in Coventry last night following a collision with a car. The incident happened at the junction of Livingstone Road and Lockhurst Lane, Foleshill, Coventry shortly after 11.00pm last night (Monday). Two ambulances, a paramedic officer and the critical care car from The Air Ambulance Service with a paramedic and doctor on board attended the scene. A West Midlands Ambulance Service spokeswoman said: “When ambulance crews arrived they found the cyclist, a man, lying in the road and was unconscious following a reported collision with a car. “Whilst the man had suffered no obvious serious injuries to the rest of his body, when ambulance staff were assessing him he regained consciousness but was displaying signs of suffering a potentially serious head injury. The team worked quickly to stabilise his condition with advanced pain relief before he was fully immobilised with a scoop stretcher and pelvic splint. “The man was taken by land ambulance on blue lights to University Hospital Coventry and Warwickshire for further trauma care. The doctor and paramedic travelled with the ambulance crew to hospital to continue treatment en route. Monday 21st August 2017 – 3.50pm – Claire Brown. A man has escaped serious injury after ending up in a 50ft pit at a waste facility in Coventry. West Midlands Ambulance Service was called to reports of a man who was trapped in a vehicle which had fallen into a pit at the waste facility on Bar Road in Coventry shortly after 10.30am this morning (Monday). An ambulance, two paramedic officers, the Trust’s Hazardous Area Response Team (HART) paramedics and the critical care car from The Air Ambulance Service were sent to the scene. Monday 21st August 2017 – 10.00am – Claire Brown. Sometimes it’s just not possible to save a life. This was tragically the case faced by ambulance staff at the scene of a collision in Yardley yesterday. West Midlands Ambulance Service was called to near the Holiday Inn on the Coventry Road, Yardley, Birmingham in the early hours of Sunday morning (4.49am). Two ambulances and a paramedic officer attended the scene. Monday 21st August 2017 – 9.20am – Claire Brown. A multi-vehicle collision on the M6 in the early hours required a large ambulance service presence due to the number of people injured. 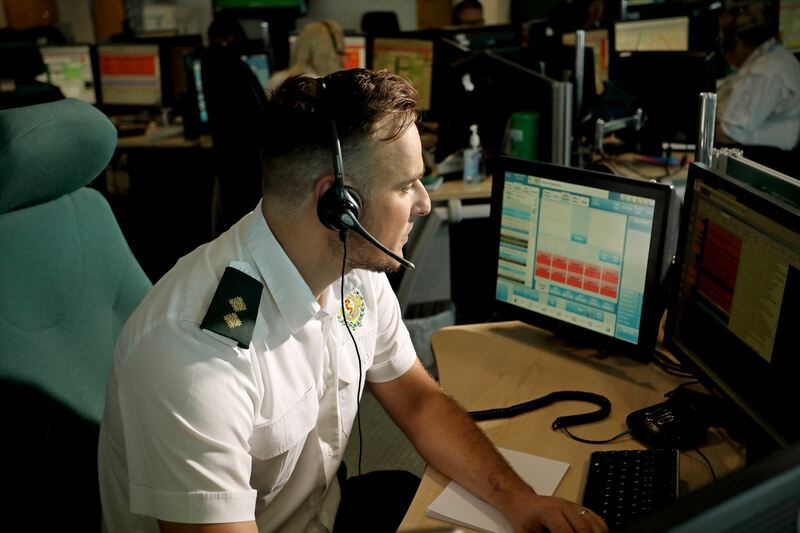 West Midlands Ambulance Service was called to reports of a collision involving several vehicles on the northbound carriageway of the M6 between junctions 5 and 6, Castle Bromwich, Birmingham at around 1.45am (Monday). A paramedic officer, MERIT with a doctor and critical care paramedic on board, HART paramedics and six ambulances attended the scene. 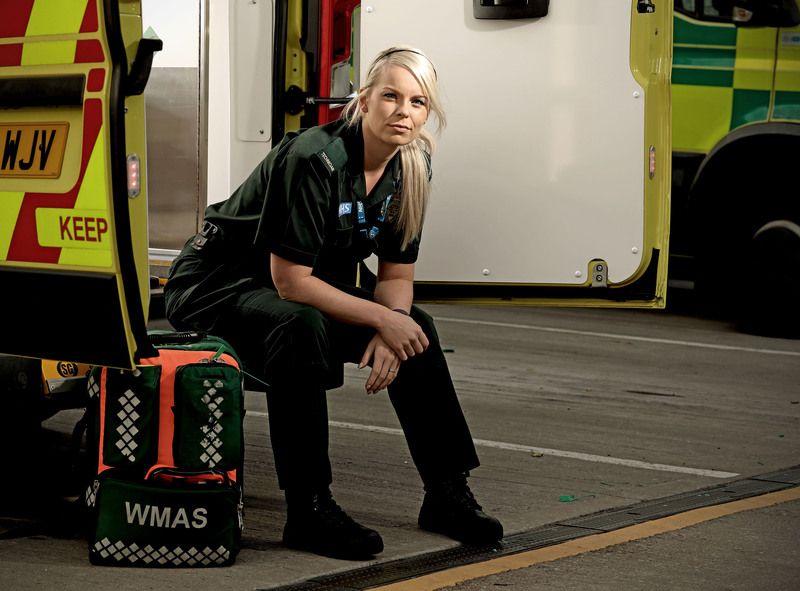 A West Midlands Ambulance Service spokeswoman said: “When ambulance staff arrived they worked quickly as a team to triage those involved to establish the seriousness of their injuries. Of those involved, a total of seven patients required treatment on scene. “A man in his 30s, who had reportedly been thrown from the vehicle, suffered a serious head injury. Once stabilised by medics, the man was taken by land ambulance on blue lights to Queen Elizabeth Hospital Birmingham. “A 19-year-old girl was assessed by the MERIT doctor after suffering a head injury and a loss of consciousness following the collision. She was given treatment on scene before being taken to Queen Elizabeth Hospital Birmingham. “Patient three was a woman who had chest pain. She was taken to Heartlands Hospital. “Three children involved in the collision received treatment by ambulance staff on scene. A teenage boy, who had also reportedly been thrown from the vehicle, sustained head, knee and ankle injuries. He was taken on blue lights to Birmingham Children’s Hospital. Two younger children suffered minor injuries and were taken to Heartlands Hospital as a precaution. Friday 18th August 2017 – 1.25pm – Jamie Arrowsmith. A man has died and a second has been taken to hospital following a collision between a lorry and a van on the M6 this morning. West Midlands Ambulance Service was called to the southbound carriageway, between junctions 6 and 5, at 9.13am this morning and sent two ambulances, a paramedic officer and the Midlands Air Ambulance from Cosford to the scene. 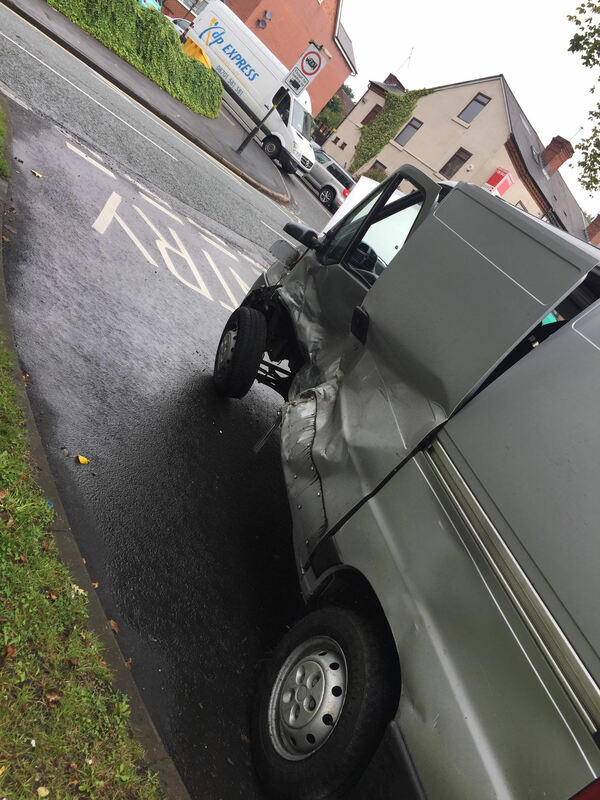 A West Midlands Ambulance Service spokesman said: “On arrival, crews discovered the van driver, a man, in cardiac arrest at the roadside having suffered serious injuries in the incident. “CPR commenced immediately and advanced life support was administered but unfortunately it became apparent nothing could be done to save the man and he was confirmed deceased. Wednesday 16th August 2017 – 5.15pm – Murray MacGregor. A motorcyclist has died after a serious crash. The incident happened at about 2.15pm on the A41 at Prees Higher Heath near Whitchurch in Shropshire. A rapid response vehicle, two ambulances and the Midlands Air Ambulance from Cosford with a trauma doctor and critical care paramedic on board were sent to the scene. A West Midlands Ambulance Service spokesman said: “We were called to reports that a middle-aged man had come off a motorcycle after a collision. “A police community support officer who was at the scene had started CPR. Ambulance staff took over and carried out advanced life support. “Tragically, despite all efforts, it wasn’t possible to save him and he was confirmed dead at the scene. Wednesday 16th August 2017 – 9.17am – Murray MacGregor. A mother and daughter have suffered serious injuries after a collision with a car. The collision happened at around 8.25pm on Waterloo Road, near to the junction with Hawthorne Street, Cobridge, Stoke on Trent. Two ambulances, two doctors from the North Staffs BASICS scheme and a paramedic officer were sent to the scene. A West Midlands Ambulance Service spokesman said: “On arrival, ambulance crews found a 17-year-old woman and her 2-year-old daughter with serious injuries. “Police told ambulance staff that following the collision, the vehicle had made off from the scene. Monday 14th August 2017 – 2.15pm – Claire Brown. A lorry driver has suffered potentially serious injuries after the heavy goods vehicle overturned on a roundabout in Stoke-on-Trent this morning. West Midlands Ambulance Service was called by the police shortly before 11.00am to the junction of the A50 and A500 today (Monday). An ambulance, a paramedic officer, a BASICS emergency doctor and the Midlands Air Ambulance from Cosford with two further doctors and a critical care paramedic on board attended the scene; the air ambulance landed on the car park of nearby Stoke City Football Club. A West Midlands Ambulance Service spokeswoman said: “When ambulance staff arrived they found an overturned lorry with the driver trapped inside the cab. Upon assessment, the man in his 40s was found to have sustained potentially serious injuries to his head, chest and abdomen and whilst ambulance staff worked to administer trauma care to him, the fire service worked around the team to help release the driver from the vehicle. Friday 11th August 2017 – 5.00pm – Claire Brown. A motorcyclist and a pillion received emergency treatment by ambulance staff this afternoon. West Midlands Ambulance Service was called to reports of a collision involving a car and a motorcycle on The Radleys in Sheldon, Birmingham shortly after 3.30pm (Friday). Two ambulances, a paramedic officer and the Warwickshire and Northamptonshire Air Ambulance with a doctor on board attended the scene. A West Midlands Ambulance Service spokeswoman said: “The motorcyclist, a man, sustained serious head and facial injuries in the collision and required advanced trauma care at the roadside by the doctor and ambulance colleagues in order to help stabilise his condition. The man was transferred by land ambulance on blue lights to Queen Elizabeth Hospital Birmingham; the doctor travelled in the ambulance to continue treatment en route. Friday 11th August 2017 – 9.50am – Claire Brown. Seven people needed assessment by the ambulance service last night after a collision between a motorhome and a car in Coventry. West Midlands Ambulance Service was called to the slip road off Dunchurch Highway in Allesley, Coventry shortly after 7.00pm (Thursday). Three ambulances, two paramedic officers and the Midlands Air Ambulance from Tatenhill with a paramedic and BASICS doctor on board attended the scene. A West Midlands Ambulance Service spokeswoman said: “When ambulance staff arrived the found a car and a motorhome which had collided. Thankfully, all occupants had managed to self-extricate from the two vehicles and were awaiting assistance from the emergency services. “Three men from the car, all believed to be in their 20s, were assessed and required treatment. One man, the driver of the car, was found to have sustained a serious leg injury. He was administered pain relief to help ease his condition before ambulance staff carefully immobilised him with a neck collar, spinal board and leg splint. The man was taken by land ambulance on blue lights to University Hospital Coventry and Warwickshire. One passenger suffered head and back injuries whilst the second passenger had neck and back injuries. Both were immobilised before being conveyed to the same hospital by land ambulance. Thursday 10th August 2017 – 5.50pm – Murray MacGregor. An elderly man who crashed the car he was in as he exited a multi-storey car park has been taken by ambulance for specialist care. The incident happened at the car park in Mill Lane, Solihull at about 12.15pm on Thursday lunchtime. A rapid response vehicle, an ambulance, a paramedic officer and the Warwickshire and Northamptonshire Air Ambulance were sent to the scene. A West Midlands Ambulance Service spokesman said: “The man was driving on a down ramp when his car collided with a concrete pillar. “When ambulance crews arrived, they found a car that had a ‘bullseye’ star fracture on the windscreen. There was a concern that the 83-year-old had also been knocked unconscious briefly. “He had suffered serious facial injuries and was also suffering from chest pain. “He was assessed and had his condition stabilised by ambulance staff and the aircrew at the scene. Wednesday 9th August 2017 – 1.55pm – Murray MacGregor. Ambulance staff who attended a crash earlier say considering the level of damage to the vehicles and the wall of a nursery, it is more than fortunate that no-one was seriously hurt. 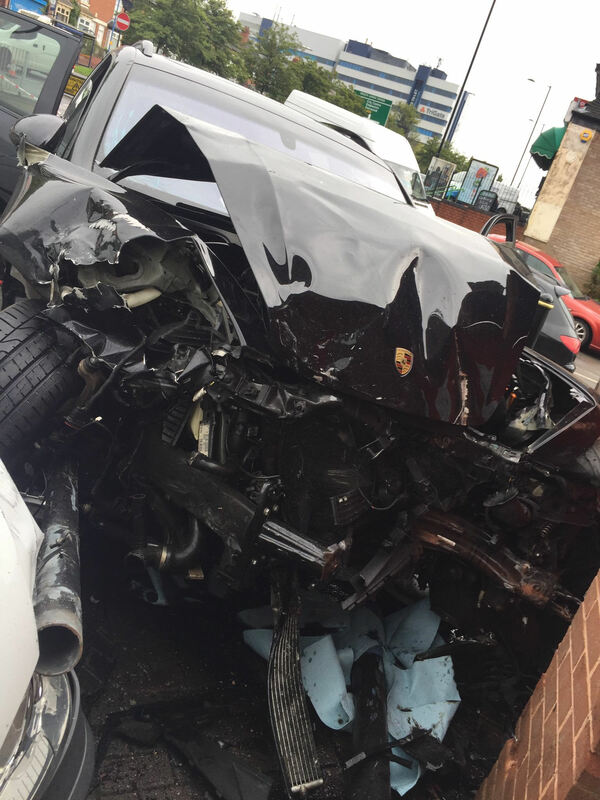 The collision happened outside Happy Days Nursery in Hagley Road West, in the Quinton area of Birmingham at about 10.45am this morning (Wednesday). A West Midlands Ambulance Service spokesman said: “When crew arrived they found a white panel van was significant damage to the front passenger side. Close by a Porsche Cayenne was resting against the wall of the nursery and a second panel van, which was parked. It had very substantial front end damage. 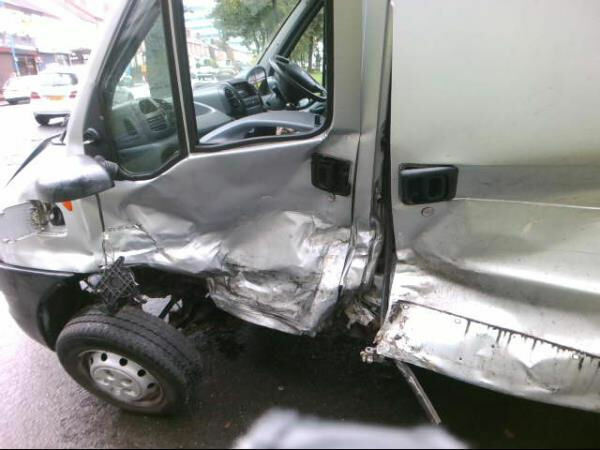 “The driver of the first van, a 63-year-old man, was complaining of rib and seatbelt pain. He had been able to get out of vehicle himself. After an assessment and pain relief at the scene, he was taken to the Queen Elizabeth Hospital, Birmingham as a precaution. “The 22-year-old man driving the Porsche had some minor seatbelt pain. He didn’t want pain relief or to go to hospital so was discharged with advice. “There were no casualties within the nursery. In an article in the Shropshire Star today, you can read the views of Operations Manager Dan Stretton on the abuse he and many other staff face on a daily basis. Sadly, attacks on ambulance staff are rising. Dan says: “Enough is enough”. Tuesday 8th August 2017 – 5.00pm – Claire Brown. A man who had to cut himself free after a falling tree landed on him has escaped serious injury in Worcestershire this afternoon. West Midlands Ambulance Service was called to an area of woodland near to Stud Lane, Abberley, Worcester at 12.50pm (Tuesday). An ambulance, a paramedic officer, a local Community First Responder (CFR) from Eardiston, the Midlands Air Ambulance from Strensham and the Trust’s Hazardous Area Response Team (HART) paramedics were sent to the scene. A West Midlands Ambulance Service spokeswoman said: “When ambulance staff arrived, they were greeted by friends of the man at a rendezvous point on Stud Lane who used their own 4×4 vehicle to take the team into the woods. The man was approximately a mile away from the property which was treacherous underfoot and inaccessible by ambulance. “Once with the patient, ambulance staff found a man who had been pinned underneath a tree by his legs. Luckily, the man had managed to use his chainsaw to cut the tree into pieces to release himself. The man, in his 30s, was conscious and breathing and had sustained leg injuries. He was given pain relief to help ease his discomfort before the team worked to immobilised him with a multi-integrated body-splint stretcher which is made of tough fabric and has carry handles to help lift and move a patient. “The team carried the man up an embankment to the awaiting helicopter, which had landed nearby, before he was airlifted to Worcestershire Royal Hospital. Tuesday 8th August 2017 – 9.30am – Claire Brown. Despite the best efforts of the emergency services last night, nothing could be done to save a car driver following a collision with tree in Telford. West Midlands Ambulance Service was called to Ironbridge Road in Madeley shortly before 10.30pm (Monday). Three ambulances, a paramedic officer at a MERIT trauma doctor attended the scene. A West Midlands Ambulance Service spokeswoman said: “When ambulance staff arrived they found a car which had collided with a tree. The driver was in cardiac arrest and was already being given CPR by fellow emergency services. Ambulance staff took over resuscitation efforts and continued advanced life support. Sadly, the driver was confirmed dead a short time later. Monday 7th August 2017 – 8.50am – Murray MacGregor. A young cyclist has been anaesthetised by an air ambulance doctor after a collision with a car. The incident happened in Ormond Road in Rubery at about 12.45pm on Sunday lunchtime. An ambulance was on scene in five minutes and was backed up by a paramedic officer and the Midlands Air Ambulance from Cosford with the MERIT trauma doctor and a critical care paramedic. A West Midlands Ambulance Service spokesman said: “The Trust received a 999 call stating that the 12 year old was on his bike when he was in collision with a car. “When ambulance staff arrived, there was no car at the scene. “An off-duty nurse was tending to the child when ambulance staff arrived. “The youngster had suffered a serious head injury and was not fully conscious. The doctor on the aircraft decided to anaesthetise him at the scene before he was taken on blue lights to the paediatric major trauma centre at Birmingham Children’s Hospital; the doctor and critical care paramedic travelled with the ambulance crew. Friday 4th August 2017 – 12.15pm – Claire Brown. A pedestrian who was in collision with a car needed speedy treatment by ambulance staff late last night in Coventry. West Midlands Ambulance Service received several 999 calls to reports of a car which had reversed, colliding with a pedestrian, on Holbrook Lane at 11.45pm (Thursday). An ambulance, a paramedic officer and a critical care car from The Air Ambulance Service attended the scene. A West Midlands Ambulance Service spokeswoman said: “Ambulance staff arrived to find a pedestrian, a man, who had sustained a potentially serious head injury following a collision with a car. Thursday 3rd August 2017 – 9.20am – Claire Brown. A teenage boy received advanced trauma care at the scene of an RTC last night in Shrewsbury. West Midlands Ambulance Service was called to a road in Upton Magna near to the primary school, Shrewsbury, at 11.15pm yesterday (Thursday). Two ambulances, a paramedic officer and the MERIT trauma team with a doctor and paramedic on board attended. A West Midlands Ambulance Service spokeswoman said: “When the emergency services arrived they found a car which had collided with a concrete post; four occupants were out of the car. A 16-year-old teenage boy, a rear seat passenger, was unconscious. Upon assessment by ambulance staff he was found to have sustained a serious head injury. Whilst ambulance staff worked to administer trauma care to the boy, the fire service quickly worked around them to release the teenager from the wreckage. “The boy was given advanced pain relief, oxygen and other interventions to help stabilise his condition before he was immobilised onto a spinal board and alerted to Royal Stoke University Hospital for further emergency care; MERIT travelled in the back of the ambulance with the crew to continue treatment and monitoring en route. Tuesday 1st August 2017 – 8.00am – Murray MacGregor. West Midlands Ambulance Service and the University of Sheffield have launched a trial which could save lives, reduce the time patients spend in hospital and save money. The ‘ACUTE’ trial is looking at patients who suffer from life threatening acute respiratory failure. The condition often results in patients spending long periods of time in hospital, frequently in intensive care. The condition happens when heart or lung disease suddenly develops or worsens and leads to patients being unable to maintain oxygen levels in the blood. As many as one in eight patients will die from the condition. Patients with conditions such as COPD (chronic obstructive pulmonary disease) and particularly serious cases of pneumonia are often victims of the condition, where they struggle to breathe. Ambulance staff currently provide oxygen delivered at normal pressure through a loose fitting mask. Under the trial, ambulance crews will use a CPAP device (continuous positive airway pressure). It involves delivering oxygen under increased pressure through a close-fitting facemask effectively forcing oxygen into the lungs. This allows the oxygen to be taken into the blood stream and also allows carbon dioxide to be released. 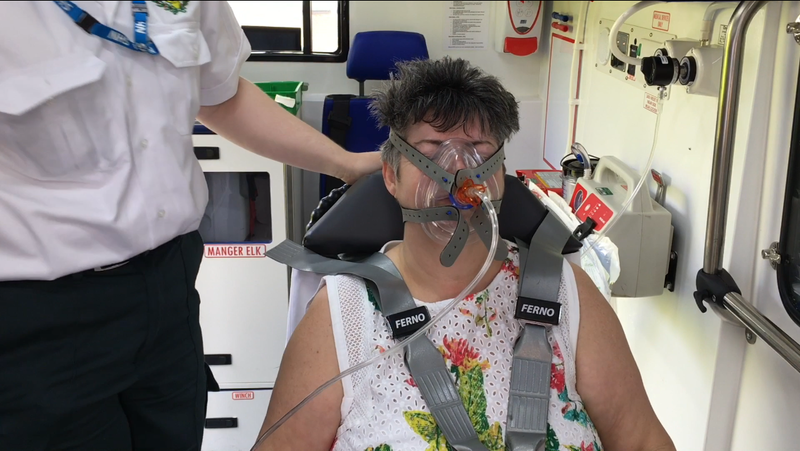 The ACUTE (Ambulance CPAP: Use, Treatment effect and Economics) trial, will involve ambulance crews in Staffordshire and Birmingham. Staffordshire historically has higher rates of respiratory disease. This pilot study will be used to see if a full trial of CPAP (Continuous Positive Airway Pressure) is feasible, acceptable and cost-effective. Ambulance staff will identify adults with acute respiratory failure. In total, 120 will be included in the trial. Half will receive CPAP while the other half will be treated with standard oxygen therapy. All patients ill then undergo normal hospital treatment and will be followed up for a month. The researchers at the university will measure each patient’s quality of life, need for admission to intensive care, length of stay in hospital and health service use. The results will then be used to establish whether it is feasible and affordable to conduct a full-scale trial evaluating CPAP and how such a study could be carried out.